It can be difficult to look at your paycheck and see upwards of 15% of it sent to the government. Of course, those taxes pay for worthwhile causes, a fact that doesn’t always lessen the initial sting of seeing your money disappear. Thanks to local and state taxes, though, residents in some places have it much worse than others. Below, we look at data from the 25 largest cities to estimate how much the average full-time worker pays in income taxes. In order to rank the places where workers pay the most in taxes, we looked at data for the largest 25 cities. Specifically, we looked at earnings for full-time workers and ran those numbers through SmartAsset’s free paycheck calculator. Check out our data and methodology below to see where we got our data and how we put it together to create our final rankings. More money, more problems As a general rule, the more money you earn, the more you will pay in taxes. Across our top-10 cities where full-time workers pay the most taxes, for example, the median full-time income is $55,435. At the bottom, where the effective income tax is lower, the median income for full-time workers is $41,119. California packs the biggest punch The combination of high-income taxes and high earnings means people in the Golden State pay a lot in income tax. The good news, of course, is that earning more is always better than earning less, as long as the marginal tax rate is less than 100%. The average full-time San Francisco worker pays a larger share of his or her income to the taxman than workers in any of the other 25 largest cities. One reason for that is the fact that San Francisco’s residents have high incomes. Residents who earn more tend to pay a higher portion of their income in taxes. In total, we estimate that the average San Francisco full-time worker pays $23,781 in income taxes, equal to 29.4% of income. Washington, D.C. full-time workers pay slightly less than San Francisco workers, on average. According to our data, the median full-time worker in Washington D.C. pays $19,200 in income taxes, with a take-home pay of $51,500. That equals 27.2% of income going to the tax authorities. 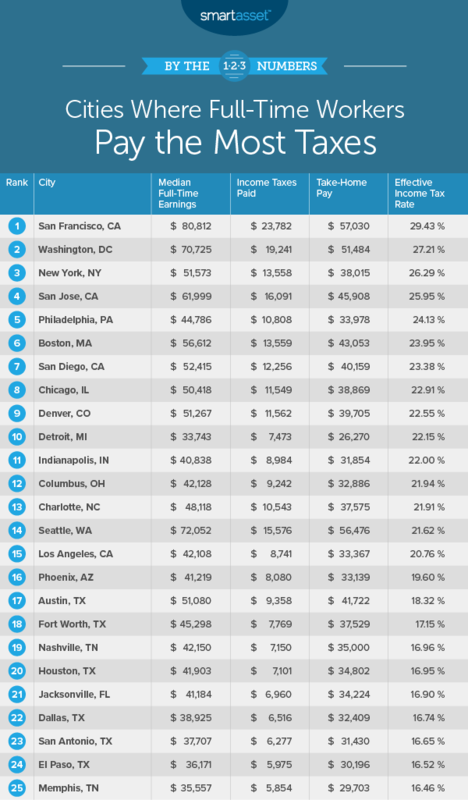 Despite the tax differences, San Francisco residents still earn more than $6,000 more in take-home pay than residents in the nation’s capital. New York City residents pay three different kinds of income taxes: federal, state and local. That means despite the fact that the average full-time worker here earns just $51,600, he or she pays 26.3% of income in taxes. By contrast, residents in Austin who make just under $51,100 per year, pay less than 20% of their income in taxes. In total, on a pre-tax income of $51,600, we estimate the average full-time worker in New York would be left with $38,100 after taxes. Another California city comes in fourth. California has a high marginal income tax rate, which tops out at 12.3% for incomes above $537,498. Unfortunately, the average full-time worker only earns $61,200. On that income, we estimate $16,100 will go to taxes alone. About $46,400 will be leftover as take-home pay. The City of Brotherly Love takes fifth. This is another city where the local authorities pile on additional taxes on top of the state and federal income taxes. The average full-time earner here earns about $44,800. We estimate that for the average worker, 24.1% of that income would go to income taxes. That would leave the average full-time worker with about $34,000 to cover housing, food and other expenses, not to mention parking some money away in a savings account. Fortunately, Philadelphia is a relatively affordable city. Boston is another coastal city with high income taxes. Specifically, Massachusetts places a 5.1% flat income tax rate on all income. The net result of that is the average full-time worker in Boston pays just under 24% of income in income taxes. One relief for Boston workers, though, is the low sales tax rate in the Bay State. The statewide sales tax rate of 6.25% is one of the lowest in the country. San Diego full-time workers earn less than their neighbors in San Jose and San Francisco. Nevertheless, they still pay a significant chunk of their income in income taxes. According to our analysis, the average full-time worker here earns $52,400 and takes home roughly $40,200. That means an effective tax rate of 23.4%. The average full-time worker in Chicago earns $50,400 per year. After taxes, though, we estimate he or she will take home just $38,900. That means roughly $11,500 goes to taxes. Illinois, like Massachusetts, has a flat income tax rate. All income here is taxed at a rate of 4.95%. Full-time workers in the Mile High City pay slightly more than 22% of their income in taxes, according to our analysis of Census Bureau data. In more concrete terms, the average full-time worker here pays $11,500 in taxes and has a take-home income slightly less than $40,000 per year. But full-time workers who are homeowners get a little reprieve from paying high taxes here. Denver is one of the strongest housing markets in the country, and Colorado levies some of the lowest property taxes. Our analysis of the full-time worker in Detroit shows they have a take-home income of roughly $26,270. That equals an effective income tax rate of 22.1%. Take home pay of $26,270 certainly does not leave a lot left over for saving or investing, so residents here will need to be savvy budgeters if they want to hit their financial goals. In order to rank the places where full-time workers pay the most in taxes, we looked at data for the 25 largest cities. Specifically, we took the median earnings for full-time workers and ran those figures through SmartAsset’s paycheck calculator. We then ranked the cities based on the effective income tax rate for the average full-time worker. Create a budget For most people, the key to financial freedom is cutting expenses. But until you know exactly where you are spending money, you can hardly begin to start making cuts. If you are wondering how to budget for different categories of your life, we recommend the 50/30/2 budget. According to the 50/30/20 budget, you should spend 50% of your income on needs like housing and food and 30% on entertainment and wants. Then you should save the remaining 20%. Ask an expert To increase your savings rate in a significant way, you need to make your money work for you. Even in high-yield savings accounts, which are safe places to park your money, you won’t be earning enough in interest to ensure a secure financial future. What you need to do is invest. But investing can be risky. To ensure you are not taking on too many risks, it may make sense to talk to a financial advisor. If you are not sure where to find a financial advisor, check out SmartAsset’s financial advisor matching tool. 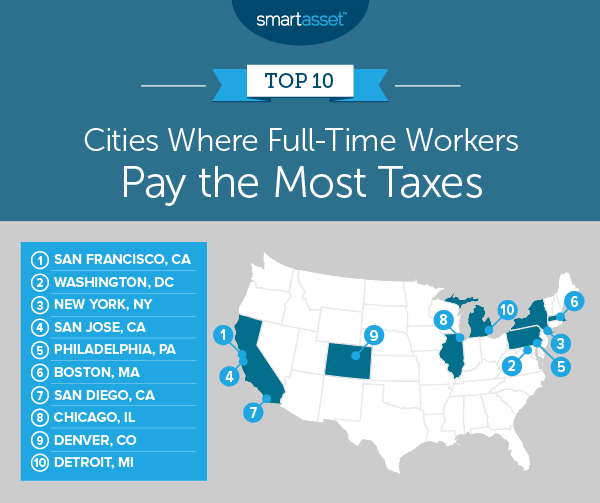 The post Where Full-Time Workers Pay the Most Taxes: 2019 appeared first on SmartAsset Blog.